Posted: June 8th, 2014 under 6M, Hamradio. On May 1st, I worked TZ6BB on 40M CW for a new one on 40M. The qso was confirmed that same evening on LoTW. Thank you Fernando. PJ7RV was worked on 15M CW for a new one on 15M. On May 2nd, I worked TJ3SN on 12M CW. This one was quickly confirmed on LoTW. Hope to see you on 6M Nicolas. On May 3rd, I worked F5KKD/p on 15M SSB from EU-070 for a new iota. 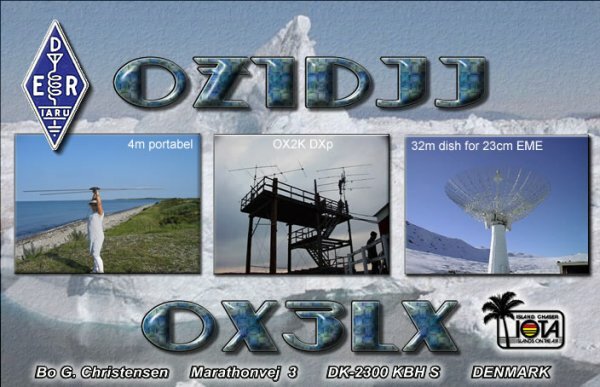 On May 6th, I worked Bo OX3LX on 17M and 30M CW from NA-134 for a new iota. PY7RP/6 was worked on 15M CW from SA-080 for a new iota. On May 9th, I worked NH0J on 20M RTTY for a new one on RTTY. PJ5/K6NAO was worked on 17M CW for a new one on 17M. On May 10th, I worked MX0INT on 20M CW from EU-109 for a new iota. On May 13th, I worked YB5IR/5 on 30M CW from OC-107 for a new iota. On May 15th, I worked YF1AR/6 on 20M SSB from OC-270 for a new iota. On May 16th, I worked IS0BSR/IM0 on 6M SSB from JM48. That was a new gridsquare for me. On May 17th, I worked YB4IR/5 on 17M CW from OC-106. On May 18th, I worked FY/F5UOW on 12M CW from SA-020 for a new iota. YB4IR/5 was worked on 17M CW from OC-109 for a new iota. On May 23rd, I worked IH9/IV3NVN on 6M CW from JM56 for a new gridsquare. On May 25th, I worked YF1AR/5 on 15M SSB from OC-215. MJ0ASP/p was worked on 17M CW from EU-099. Both were new iota's. On May 26th, I worked YB8RW/p on 15M SSB from OC-209 for a new iota. On May 30th, I worked TM1INT on 15M CW and 20M SSB from EU-159 for a new iota. The Invoker Team gave me yet another new iota. On May 31st, I worked TM1INT on 6M CW and 30M CW from EU-159. I had a 6M opening where I worked several stations from Ukraine and a new grid with KN67. We have had a few 6M openings, but most of it has been to Europe. I haven't bothered working anything of it. On May 16th, I did copy A25GF for a few minutes. He faded before I could work him. On May 23rd I heard JY9FC weakly a few minutes. On May 25th, we had another 6M opening with several EA8 stations heard and some europeans. On May 31st, we had another opening, but not much of interest. I heard stations from SV5, GM, F, I, S5, G, SP, ES, HA, LZ, ER, EI, YO, SV1, OH, SV9, LY, OK and YL.